I've always been interested in eating right and following a diet and lifestyle that is holistic and organic. I love books like SuperLife because they educate, inform and motivate for better change. 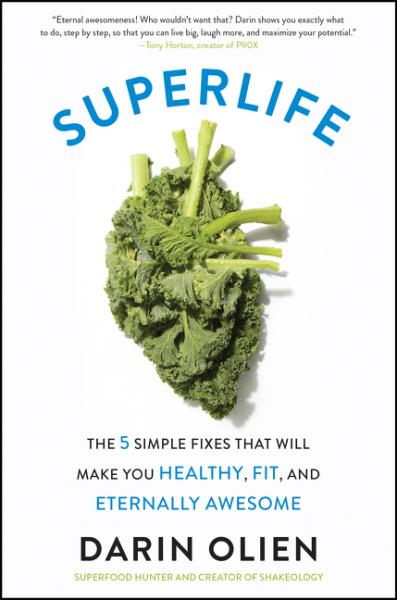 Written in Olien’s engaging conversational style, Superlife is a one-of-a-kind comprehensive look at dieting and nutrition, a timeless and essential guide to maintaining the human body and maximizing its potential. I've always been interested in eating right and following a diet and lifestyle that is holistic and organic. I love books like SuperLife because they educate, inform and motivate for better change. I am constantly frustrated because society makes it difficult to follow a healthy way of living. Our food is genetically modified and the marketing world pushes junk in our children's faces. As a parent, I am constantly trying to teach my kids why certain foods are bad for them. Books like SuperLife keep me from giving up. And the book cover is neat, isn't it? A bunch of kale leaves that looks like a human heart. Simple and clever. As soon as I started reading SuperLife, I was enjoying it. Darin Olien is far from dry and he pulls the reader in with his own story. He admits candidly that he is not a professional scientist, but an eternal student. He had me right there. (He does have a BA in exercise physiology/nutrition and an MA in psychology) As I continue reading, I hear a lot of what I already know, but need to hear again and again. For me, lifestyle change is hard because I live with other members who are not always on board, so if I'm not reading and getting encouragement, then it's easy to give up. SuperLife is motivating because Darin first informs and teaches. The book is divided into two parts: The Five Life Forces and The Really Useful Section which provides practical strategies, pantry staples, recipes and a list of daily simple fixes. He also includes an Acid-Alkaline list, resources and a handy index. I found this part so helpful! And I was happy to see that I am already doing some of the things he suggests and I have already incorporated some of his daily fixes, like getting outside every day. Because I work from home, this is one of the best things I can do, both for my physical and emotional wellbeing. In the first part, we learn more in depth about the five life forces: Nutrition, Hydration, Oxygenation Alkalization and Detoxification. After each chapter in this section there is a simple to-do list that summarizes the info and moves one to action. There were many a-ha moments for me as I read through this section, my highlighter in hand. I appreciated the chapter on How to Feed the Kids, too. SuperLife is packed with useful, enlightening and practical information for anyone interested in wellness and a healthy lifestyle. If you're struggling with this, then this book can give you the motivation you need to get going. If you enjoy a healthy lifestyle, this book will reinforce you to keep going and may give you insight if there are any things you may have missed. This book is not on my bookshelf but in the kitchen where I can reference it easily to implement some simple strategies that give me back control of my health. It's going on my list of favorite non-fiction books. Disclosure: Thanks to the publisher and TLC Book Tours for sending me this book for review. I was not compensated in any other way, nor told how to rate or review this product. Darin Olien is an exotic superfood hunter, supplement formulator, environmental activist, and widely recognized authority on nutrition and natural health. He partnered with the fitness company Beachbody to formulate the wildly popular whole-food supplement Shakeology and the comprehensive plant-based Ultimate Reset 21-day detoxification program. He also sits on the board of Raincatcher.org, a nonprofit dedicated to providing clean drinking water. He holds a BA in exercise physiology/nutrition and an MA in psychology, and lives in Malibu, California. Find out more about Darin and SuperLife at his website, and connect with him on Facebook, Twitter, and Instagram. Motivation and simple ways to implement good ideas are the things I struggle with. This book sounds like it can help me with both of those! Same here Heather, which is why I liked this book. I'm an eternal student as well (as are most readers, IMO), and I find you can never learn too much about your body and health and food and nutrition!